Peruvian born internationally acclaimed shamanic teacher and healer, don Oscar Miro-Quesada discusses his new audio book Healing Light, how he dreamt it into being and his desire for all of us to become Shining Ones. SM: The image on the CD cover is gorgeous. Is that Machu Picchu? OMQ: Yes, right in front of Machu Picchu, when you’re looking out, down toward the valley, and that Apu (mountain) is called Putucusi, which means Beautiful Skull.It’s considered the Mother Mountain of all the other Apus that surround Machu Picchu, which are 21 in number. She gave birth to all the children that are surrounding her. That’s the legend. SM: Let’s talk about the title “Healing Light.” How does it relate to what’s on the CD? OMQ: [after aligning himself with a prayer] Healing Light means the wholeness of our own radiance as awakened spiritual passers-by on planet Earth. The word healing derives from the root which means to make whole and light derives from the Latin lux, which means to Illumine. So the title means illumined wholeness and was chosen to appeal to a broader spectrum of earnest seekers that are looking to, not only apprentice in core shamanism, yet understand shamanism as a sadhana, an evolutionary spiritual practice that can lead to a much deeper experience of intimacy with the natural world. From a personal level, it awakens one’s own experience of wholeness; at the planetary level it gathers a critical mass together that will live with reverence toward the earth at this time. Those two levels are implied in the title. SM: You mentioned ‘earnest seekers.” Who should listen to this CD? OMQ: My fondest dream is that people will be attracted to listening from all walks of life, not necessarily only those interested in deepening their existing shamanic practice or those people who have been in workshops, either in person or virtually with me. That is why the teachings have been distilled in a way that touches upon spiritual traditions from the four directions, from all over the world, integrated or founded upon the Pachakuti Mesa Tradition model of cross cultural shamanism. I’m hoping for this work to be an awakening catalyst, an inspirational transmission of perennial wisdoms and shamanic teachings that will be able to benefit of people just starting out on their journey of shamanic initiation, as well as the more advanced adepts of the work, people who have been working with me now for three decades. Those who have already listened to this program found it offers a level of additional clarity to the cosmovision and ritual healing practices I have taught over the years. The guided journeys I facilitate are both for contact with one’s self intra-personally, contact with others interpersonally, and contact with the One Source, the Great Originating Mystery, to integrate self, culture and nature when listening to them, and I feel that everyone on this planet can benefit from that integrating experience. SM:So, there’s new material in this course? OMQ: In each of the sessions there is journeywork and the guided journeys that lead to an expanded state of shamanic awareness, given that by invoking the soul presence my two mentors, don Celso Rojas and don Benito Corihuaman while I was in the recording studio, I feel resulted in probably some of the best teachings in the form of journey work that have come through me. There’s a lot of novelty upon this good earth and we must differentiate between something new and something novel, so I’d say that teachings came through that had never been never been articulated before and spontaneously occurred during the recording of this program. So yes, there is new material. Fresh and deeply evocative of the grace and beauty of soul. SM: Let’s talk about oral tradition and the passing on of information instead of by the written word, by the spoken word. At one point when you were working on the book The Pachakuti Mesa with Matt McGee, you had been reluctant to write things down, as opposed to sharing them orally. What has changed? OMQ: This has been an evolving experience in my call as a mentor of these arts because I did take an oath of oral transmission as part of my Compacto with don Benito to bring the kamasqa curanderismo of Peru forward into the modern world, and for the first three fifths of my earth-walk as a shamanic teacher, I wholeheartedly adhered to such sanctioned bequeath. Then all of a sudden I started realizing that there was something more being asked of me, so the program on this CD is an amalgam, a distillation of the most core spiritual teachings that I have been exposed to consciously. Then comes the unconscious gifts that are received, the states of grace in which a voice speaks through me and that needs to be oral and that’s why when writing [the book] Lessons in Courage I spoke and [co-author] Bonnie Glass Coffin recorded everything verbatim and then we sat down and distilled it all together, so that the words written were intended to be experienced as if receiving an unadulterated oral transmission from the source when reading that work. About 5 years ago don Celso came into my dreaming and insisted that I open up to any way that offered this work a broader exposure, so I went to my Altar Mayor housed in my home medicine lodge and prayed deeply into that dream visitation and lo and behold it became evident that this was the time to offer these teachings in writing, in painting, in sculpting, through dance, in journey work, in any way that it could get out into the world and that’s when all of a sudden – boom! – countless alternative opportunities to make these teachings available to the world beyond oral means began to happen. So in 2013 Lessons in Courage was published followed by a call from The Shift Network offering me the opportunity to present my apprenticeships virtually. And since then I’ve been reaching hundreds of people rather than 30 people at in person workshops, thus fulfilling don Celso’s dream visitation request beyond imagination. SM: You said “Prior to an expression of form, there is a dreaming of that form.” Did you dream this Sounds True audio book into being? OMQ: I’d been holding for a long time a thought form that Sounds True [the publisher] would open up this possibility for me, probably now for 15 years, that they would become aware of the value of the shamanic teachings I have to offer. And so yes, in a way I did ‘dream’ it into being because I remained conscious of that yearning in my heart, that desire. SM: Is there anything you would like to have the students come away with after taking this course? OMQ: Well, certainly. I would love everybody to wake up and become a Shining One. Yet, I’ve learned over the years that any attachment to outcome is guaranteed to failure. I can pretty much guarantee that anybody who truly listens to this program, and most important, who allows these recorded teachings to listen into them, shall experientially learn to: Trust Soul, Honor Spirit, Open Heart, Transform Mind and to Heal Body. Each of the sections in the audio book cover this. Those are the five areas that correspond to the five directions of the mesa [altar] that I emphasize. So they have a clear awakening of those five fields of human evolutionary potential in their lives. The soul body, the spirit body, the emotional body, the mental body, and the physical body, these are all brought into integration, into loving relationship. I am quite confident that anybody who relaxes and feels into the teachings and can be an apprentice, meaning they can be an initiate of what they hear in word, and at the core level, their heart is going to find deeper, deeper peace in its ability to surrender to life’s wonderfully unpredictable nature and just that in itself is good medicine for the world: to become a carrier of Healing Light. 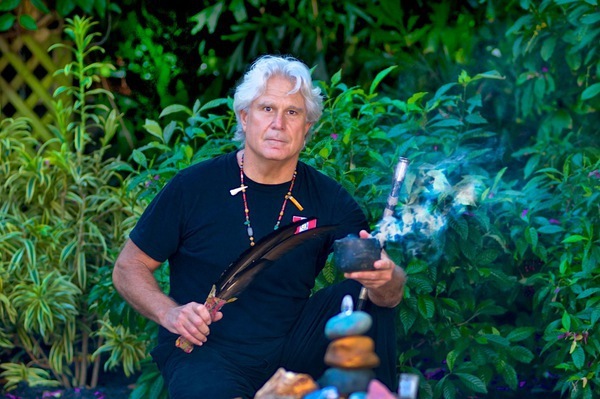 The post Interview with don Oscar Miro-Quesada appeared first on Shamans Market.